In midlife, the spirit can seem to leave all things that once motivated us. We might find ourselves slowing down and procrastinating, as if caught in quicksand. We may also find ourselves unconsciously drawn to things that once held our interest. We may replay past achievements; we may google old flames. If we are tempted to reach for that that which used to attract us, enjoyment is usually fleeting and the results disappointing. We have grown, changed. Our new interest is destined to drain away just as it had before. Midlife can also take the form of a new calling or inner summons, yet one that may not fit well within our lives. We have jobs, bills, commitments, and attachments to old ways of being. There may be no room for a new vocation. Even so, a midlife crisis can always be seen as an opportunity. It is only a crisis because it forces a choice. We can keep trying to cling to something old or let go and seek something wholly new. In so doing we may find new careers and love interests, or perhaps a radically new engagement and appreciation of our lives as they are. It could be said that we come to therapy for the same reason. We come because we are somehow stuck and want to discover the freedom to move ahead. A good midlife crisis has likely already achieved the first half of this for us. Everything feels dead to us because it actually already is dead. All we have to do to complete this stage is to accept that we have been trying to resuscitate a corpse. The other part of the work is to allow our true interests to emerge. Like all births, we must suffer it into existence. Just as chicks need to break through the egg which contains it, we must chip away our own. We must suffer the fear of entering a larger world than we had previously known. We must also suffer to let more of the world into our selves, and to become larger selves. 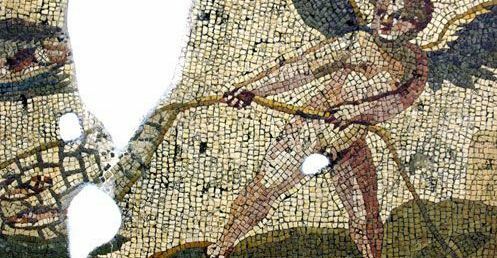 Ancient Roman mosaic of Eros fishing with a net. Yet once hatched, every chick comes inbred with the inner instructions on how to transform into the bird it is born to become. We are the same. Discovering, reading, and following these instructions are what the best therapy, especially Jungian therapy, is for. It helps us learn that which the psyche already knows, and grasp what our psyche is already reaching towards.